rlocus computes the root locus of a SISO open-loop model. The root locus gives the closed-loop pole trajectories as a function of the feedback gain k (assuming negative feedback). Root loci are used to study the effects of varying feedback gains on closed-loop pole locations. 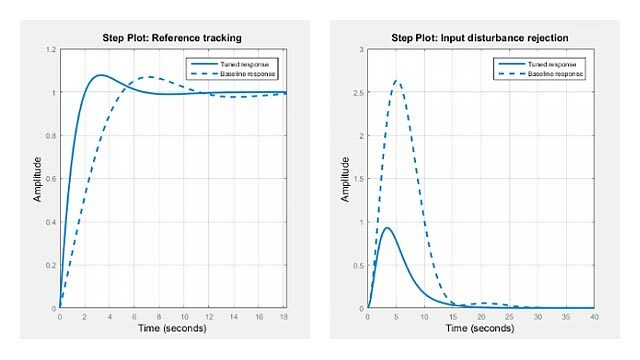 In turn, these locations provide indirect information on the time and frequency responses. rlocus(sys) calculates and plots the root locus of the open-loop SISO model sys. This function can be applied to any of the following negative feedback loops by setting sys appropriately. uses the user-specified vector k of gains to plot the root locus. [r,k] = rlocus(sys) and r = rlocus(sys,k) return the vector k of selected gains and the complex root locations r for these gains. The matrix r has length(k) columns and its jth column lists the closed-loop roots for the gain k(j). 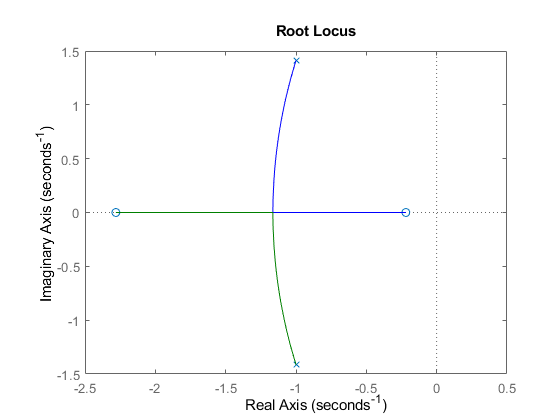 Plot the root-locus of the following system. You can use the right-click menu for rlocus to add grid lines, zoom in or out, and invoke the Property Editor to customize the plot. Also, click anywhere on the curve to activate a data marker that displays the gain value, pole, damping, overshoot, and frequency at the selected point.